It’s time to kick off the 2017 HFFL season! The long, football-less summer is almost over and we’re on the cusp of the most wonderful time of the year: Fantasy Football season! And this syllabus will provide everything you need to prepare yourself for the best fantasy football season ever! We have a number of rookies joining us this year, so welcome them! For you newbies, you should read over everything carefully so you understand how the HFFL runs. 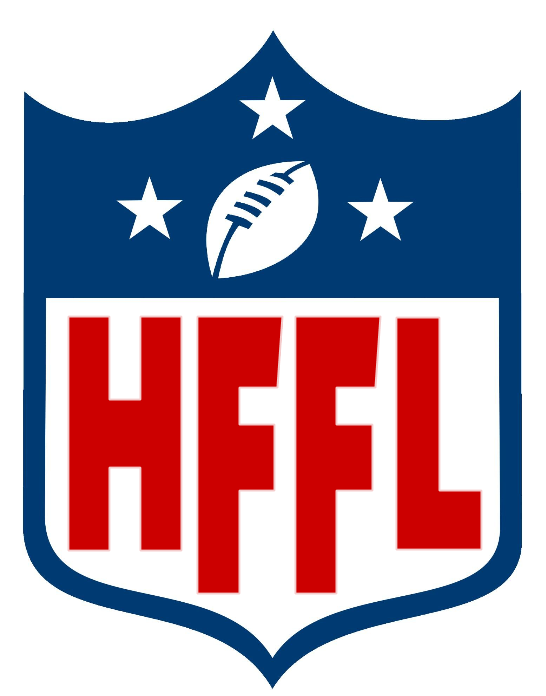 The HFFL exists as 3 separate leagues of 12 teams each, but they are all part of the HFFL universe! There are two lower leagues and one upper league. 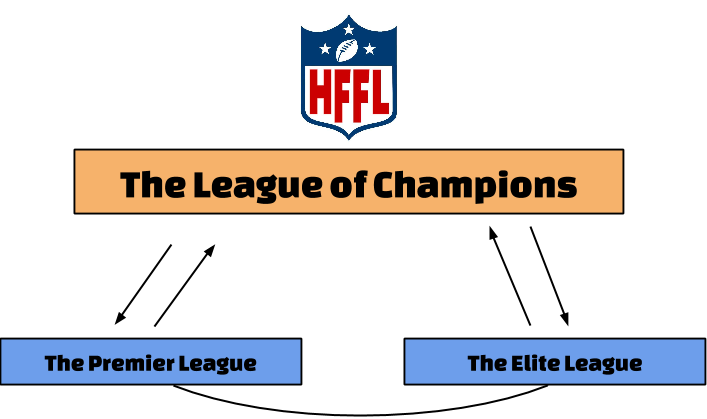 The lower leagues are the Premier League (PL) and the Elite League (EL) and the upper league is known as The League of Champions (LOC). Everyone starts out in one of the lower leagues. To get to the League of Champions, you have to earn your way in. Those managers playing in the League of Champions this year won their way in last year. More on advancement later. Our leagues are hosted on Yahoo Sports. It’s a pretty great platform and, better yet, it’s free! You’ll need a Yahoo account if you don’t have one yet. Now you can officially scope your competition! And don’t forget to find the rookies and welcome them to the madness! The LOC conducts an auction draft (Monday, August 21st at 7pm online and live at the church building). 7pm for setup and the auction will begin PROMPTLY at 7:30pm. If you’re in the LOC and are new to auction drafting, check out the Auction Draft FAQ post here. The Premier League and the Elite League conduct standard snake drafts to select players. That means you draft 1-12 in round one and then 12-1 in round two and so on. Pretty self explanatory. The actual snake draft orders are reflected in the league assignments grid above. The orders were determined using the final standings from last year for the returning teams and the rookies were randomly assigned a draft number and inserted into the order. In cases where two teams had the same draft stock number, a coin flip determined the order. In cases where three teams had the same draft stock number, a random draw determined the order. In the interests of openness, here’s how that broke down for each league. Note: League of Champions draft order is mostly irrelevant due to the nature of auction drafts. The League of Champions auction will be held Monday, August 21st, at the church building. Setup at 7pm, auction begins promptly at 7:30pm. The LOC will use the Yahoo online draft tool, so you can bid remotely from the web or mobile app. The Premier League draft will be Tuesday, August 22nd, at the church building. Setup at 7pm, draft begins at 7:30pm. The Elite League draft will be held Sunday, August 27th, at the church building. Setup at 7pm, draft begins at 7:30pm. You may bring a snack or drink (no booze) to share at your draft party! These are the dates that worked for the overwhelming majority of the owners. If you can’t make it to your scheduled draft night, you have a couple of options. 1. You can follow the draft board online and submit your picks via chat when your turn comes up. Let me know if you want to do this and I’ll set you up. We actually don’t use the Yahoo draft tool for the snake drafts because we’ve had flaky performance in the past and it’s not very flexible, so I’ll help you access the draft board on Google Docs and interact there. 2. You can ask someone you trust to submit your picks for you. I’ll be at both snake drafts as moderator and can draft your team if you trust me. Again, if you can’t be there, let me know soon so we can come up with a plan. Remember, you can’t win your HFFL Super Bowl on draft night, but you can probably lose it. We want everyone to feel good about their team and that starts at the draft. The rules are all outlined on your Yahoo league pages, so check them out there. I will mention (because it gets asked every year) that points scored by special teams count for the team defense. So if the Colts get a kickoff or punt return TD, the Colts defense gets those fantasy points. The rookies among us will also appreciate a word on Weekly Waivers and Free Agent Blind Bidding. At the start of the first game of the week, any player that isn’t on a roster is placed on Waivers. These players cannot be picked up immediately by teams. If a team wants one of these players on waivers, they must bid on him from their imaginary waiver budget ($100). The bids are blind, so you don’t know if any other team is bidding on this player or how much they are bidding. Strategy is key here. Then on Tuesday, the team with the highest bid gets the player and the other teams keep their money. This levels the playing field for those guys who aren’t watching every game on Sundays looking for breakout performances and snatching those guys up. If no one picks up a player on waivers, then on Tuesday he’s a free agent again and anyone can pick him up, “for free”, immediately. You’ll get the hang of it. And just remember, there is no ACTUAL money involved with the HFFL. Just fun! AKA, how do I get into the League of Champions next year? At the end of the HFFL regular season, the top 6 teams in each league will compete for their league Super Bowl title and the bottom 6 teams will compete for their league’s coveted Toilet Bowl title (Consolation Bracket). Now, when the playoffs are complete, the top 3 teams in each league (the title winners and the 2nd and 3rd place teams) will earn eligibility to the LOC for next season. BUT ALSO, each league’s Toilet Bowl winner will also earn eligibility! 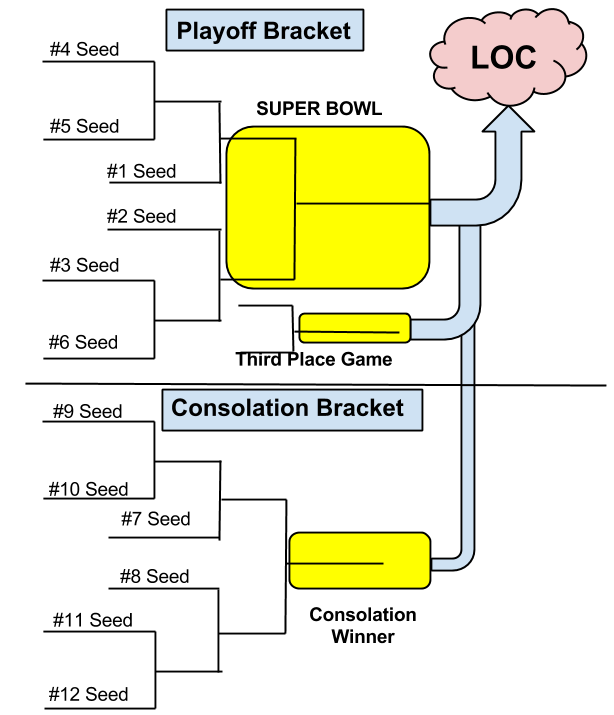 So that means that even if you finish the regular season in 12th place, you could win every game in your consolation bracket and earn a ticket to the LOC for next year! The playoffs matter for every team! Here’s a graphical way of looking at it. So four teams from each league will be win tickets to the LOC for next year. Each week, you can expect a goofy wrap-up post/email to appear in your inbox: The HFFL Universal Blast. You can also check HiawathaFantasyFootball.com which houses all the back-issues of the Blast and lots of other information – including career statistics for everyone and other geeky numbers. Okay, that should do it! Check your email soon for your official invite to your Yahoo league, click through and set up your team! You must be set up with your team to draft! It’s VERY important!